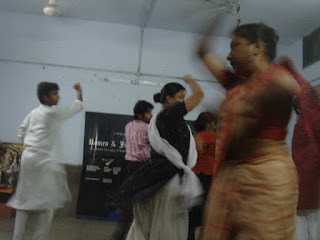 India’s best classical artists run dance schools in Delhi but is anyone interested? When they talk, fingers flutter, eye-brows quiver, heads sway, and feet shift restlessly. Recipients of prestigious awards, they are generous in sharing the secrets of their excellence. They are India’s most celebrated classical dancers who also happen to be Delhi’s best dance teachers. But who will learn Bharatnatyam or Kuchipudi instead of Salsa and Macarena in this rapidly westernizing society? Which little Harry Potter wishes anymore for Amar Chitra Katha comics from his magic wand? How can the MTV Generation be lured to Kathak and Odissi when not even a single television channel is dedicated to the Indian classical music? Indian classical dancing is not merely about coming home to the roots. Any classical form, dance or music, is an intellectual domain with a very rational approach of transmission of knowledge from the guru to the shishya. It combines science and art beautifully with the ultimate goal of attaining spiritual bliss. Birju Maharaj, Kathak’s living legend, considers dancing to be a form of Yoga where dhyan could be reached through the path of anand. Kuchipudi maestro Raja Reddy believes it makes one calm, focused, and at peace with oneself. Kaushalya, his dancer wife, shares the beauty tip that a regular dance practice keeps the body supple and the skin glowing. Anjana Ghosal, a young student who learned Kathak from Vaswati Misra, finds it fascinating that although classical dances work within well-defined parameters, they give the artist freedom to create, innovate and experiment with the form. A strong motivation drives these busy performers to invest time and efforts in educating young artists. Apart from regular income, it provokes fresh insights into their seen-it-all mind. “By teaching, lots of nuances become clear as I struggle with a student’s grasp and his potential,” Odissi dancer Sonal Mansingh says. Birju Maharaj equates the joy of teaching to that of a gardener savouring the nurturing of a growing sapling. However, the dancers are selective in picking students. Interviews are held to find the student’s aptitude besides examining body expressions, hand gestures, and the flexibility of the face. Those fortunate to be chosen are transported to a different world. With dedication and discipline, these shishyas are filled with rasa which overflows and reaches the people around them too. ← Viewpoint – Just What Can Mrs. Sheila Dikshit Do!